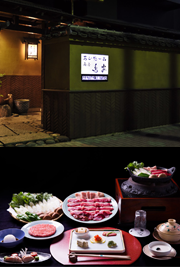 Our restaurant opened for business in 1872, and still today we serve the exact same dish–Aigamo sukiyaki–unchanged in flavor or style in well over 100 years. “Aigamo” refers to a duck that is a cross between a domestic white duck and a wild mallard. The meat of aigamo does not have that wild tang and can be enjoyed by everyone. First the breast meat is removed with the skin attached. This is cut in thick slices, roasted to sizzling deliciousness in an iron pan over charcoal, and dipped in soy sauce with grated daikon radish as flavoring. Visit us soon and see for yourself just what a treat this can be! Toriyasu underwent renovation in 2005 and we have added a dinning room with regular tables, as well as floor seating with sunken leg space.